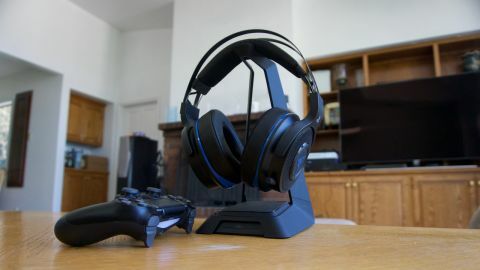 Update: Having already fallen in love with Razer's Thresher Ultimate PS4 7.1 headset package, we've now spent some quality time with it's more affordable, stand-free option, too. And we're happy to report that it's just as neat as its pricier stablemate. Read on for our full verdict. The Razer Thresher Ultimate is a beast of a gaming headset that rivals, and in some ways even surpasses, the reigning champ, the Astro A50 Wireless. The Thresher is sleek, powerful, easy to setup and versatile, supporting both your console of choice (Xbox One or PS4) as well as PC. It’s comfortable and great to wear for extended periods but, also, a bit more fragile-feeling than a $250 (£249, AU$429) gaming headset should be. One longstanding complaint that gamers have about their headphones is that they’re too fragile – the bridges of the headphones break due to a drop, and pressure cracks snap loose hinges. Thankfully, for the most part, the Razer Thresher is immune to the worst of that. It has its weaknesses, particularly around the hinges, but the headset’s bridge employs reinforced steel that should prevent the headset from cracking. On each arm, you’ll find massive 50mm drivers that have a range of 12 to 28,000 Hz. All told, the headset measures in at a massive 196 x 214 x 104.8mm (W x H x D), far larger than most cans on the market. Despite it being larger than the majority of headsets, however, it doesn’t weigh all that much (only about 408g or 0.98 lbs) and won’t you strain your neck during extended sessions. We found the padded faux-leather foam earpads comfortable but, for those who over-heat easily, Razer also offers a gel-infused set of swappable earpads that are exceptionally cool. Of course, this is a wireless headset after all, and that means the headset itself is really only half of the overall solution. To transmit the audio from your console to your headset, you’ll need the help of the included transmitter. The transmitter pulls audio information from your console of choice via an optical audio connection, but the headset itself will need to draw power from one of your system’s USB ports using the included USB cable. Beyond those two aforementioned ports, you’ll also find an additional USB port on the backside of the base that can charge your headphones, a switch to change between console and PC mode, and an optical audio out port that can pass the audio signal onto a receiver or soundbar should you want to experience game audio through the speakers. Also in the box is a plastic stand that fits around the transmitter. It’s a bit flimsy, but it works nicely as a stand for the headphones when you’re done for the day. The stand doesn’t offer wireless charging, however, which means you’ll still need to remember to connect the headset to the transmitter before you retire lest you come back to a dead headset. While the Thresher Ultimate handles game and music with unrivaled clarity and ease, we were disappointed by how limited its input options are. Basically, the only way you’re going to get audio from the Thresher is through your console – there’s no Bluetooth on-board or nary a 3.5mm jack in sight. Razer’s statement on this matter is clear: The Thresher is a premium jet-engine Selachimorpha that is to be used for gaming only. That said, you can forgive its limited ambitions when you hear just how good of a gaming headset it is. We played a number of games with the Thresher – everything from sci-fi racing games in the form of the high-octane Wipeout The Omega Collection to quieter, more nuanced experiences like Final Fantasy XII The Zodiac Age. This headset might have been bred for battle for games like Call of Duty and Battlefield, but its range and ability to unlock details are unmatched. Raising and lowering the volume are done via a scrolling wheel located on the right earcup. It’s not the most eloquent solution – ideally, all headsets would adopt some sort of easy-to-access in-line remote – but it gets the job done. Without diving too far into the seaweeds about specs here, Razer’s headphones support Dolby Audio in a 7.1 virtual channel configuration. That should give the clarity to hear enemies coming on all sides, which is compounded by the headset’s excellent separation capabilities. You won’t mistake these virtual 7.1 headphones for an object-based solution like DTS:X or Dolby Atmos, but it’s hard to knock it considering how advanced the separation is. There is a downside here, though. Because the Thresher Ultimate is a third-party headphone, it doesn’t utilize some of the console maker’s first-party technology. Sony uses a new codec called 3D Audio that’s only available on its first-party wireless headphones that straddles the line between channel-based and object-based surround sound – that means Razer won’t have access to it, and won’t benefit from that codec. That’s not necessarily a deal-breaker for most, especially considering there’s only one game that supports 3D Audio at the moment, but codec support is worth taking into consideration. Last but not least, let’s talk battery life. Razer rates its headphones at around 16 hours of game time between charges. After spending four full days with it without needing a recharge, we can confirm that number is about right. That number will likely degrade with time, but even 12 to 14 hours of play should be enough for even the most dedicated of gamers. So how well does the Razer Thresher Ultimate pick up your voice? Quite well. This makes sense when you consider the Thresher’s specs – a microphone sensitivity of -38Db@1KHz and a frequency response of 100-10,000Hz. Those we spoke to said that we came through loud and clear, with almost no additional noise being detected and little-to-no popping. Those that we spoke to did notice an occasional dropped packed (only a word or two in a longer phrase) but most of the time we were told that the audio was next to perfect. The only real issue one might have with the Thresher is that it doesn’t support mic monitoring, i.e. the ability to hear yourself in the headphones while talking. For 99% of gamers, this isn't a huge deal. But there are those out there who swear by this feature – especially on headphones that do a good job with noise isolation – and they will likely notice its absence here. The Thresher Ultimate headset is a premium option for those looking to get wireless audio from their console, and it's got a price tag to match. But, so long as you can bear losing the Ultimate's stand, Razer may have an alternative choice for you. It's also offering the Thresher 7.1 as a standard edition that drops the stand in favor of a simple USB dongle for 2.4GHz wireless connectivity. It's otherwise an almost-identical package, at a far cheaper price – the cans offer the same build quality and drivers, with the headset still working with PC and Mac platforms too. A thumbstick-sized USB dongle hooks up to a free port on your console, with a its own jack cabling the dongle up to your console's optical output. With the PS4 Slim lacking this port, it limits the headset to owners of the original PS4 and newer PS4 Pro, unfortunately. But it does have the advantage of offering audio passthrough thanks to the HDMI port still being in use – there's no need to disconnect and reset system menu options to get audio coming back out of your loudspeakers, so it's just a case of volume control. It's a handy convenience, making for an easy recommendation for the more affordable Thresher option. Razer put a lot of its focus on building out the Thresher Ultimate’s audio prowess, and that comes through loud and clear in the final product. The smallest of game details are heard with ease, and there’s a clarity here that’s hard to find elsewhere. We also enjoyed the Thresher Ultimate’s long battery life that didn’t give out during a big battle, and had enough juice for four full evenings of gaming. There are two major flaws here, however. The first is that the connection options are limited. It’s either optical audio or USB. That’s it. If you were hoping to find a chat headset that you could sync to your phone or wear around town, well, you’ll have to look elsewhere. The other problem is that while the headset definitely has that premium feel all the way throughout, it has a few weak points that will likely cause gamers some grief down the road. The hinges located right above the drivers are plastic-feeling and fragile, and very likely the first thing to break should you drop the headphones or accidentally leave them laying around. There’s no shortage of great-sounding gaming headphones out there, but what Razer has created with the Thresher Ultimate is something special. Powerful, clear audio back up a well-balanced and light design that’s uber comfortable to wear for long periods of time. It’s not 100% flawless, but for a great-sounding premium headset, it’s hard to do much better.